Paying for items on eBay will soon be more like Amazon than the traditional eBay model: instead of paying sellers, buyers will pay eBay, and then it will disburse the funds to sellers. eBay noted there would be a streamlined buyer experience with an increased choice in payment options that would be "locally relevant" and "mobile-optimized." The new experience will roll out to a very small number of users beginning this year, and will be implemented fully by 2021. 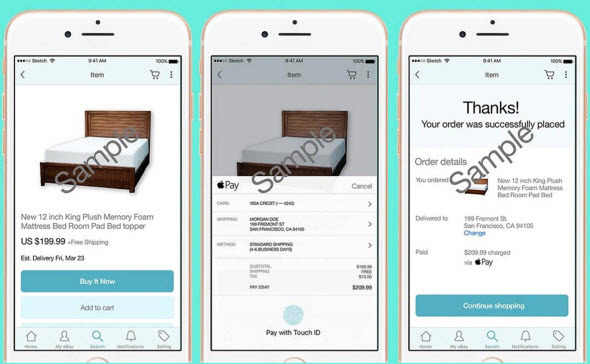 In the screenshots, eBay showed the transaction flow for a memory foam mattress pad for a bed. The "buyer" chose to use Apple Pay to pay with their Visa credit card - note that Apple Pay isn't a payment method - it's a digital wallet that stores a person's payment methods such as debit and credit cards. On the sample screenshot, it shows the checkout screen with a total amount next to the words "PAY EBAY." The final screenshot showed a "thank you" page showing the order details along with a "Continue shopping" button. You can find more information about the webinar (along with readers' reactions) on this March 7th blog post. Then you should contact Ebay and tell them that as it is NOT what they are saying will be happening. Yes, that is how the process with Ayden will work. However PP has NOTHING to do with it. PP and Ayden will NOT be commingling in any way. They are two separate and distinct ways of paying. On the site now, we have options of how to pay when we check out. Some of those options are PP or a CC. 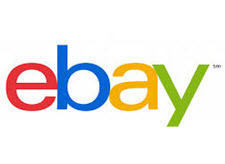 When Ebay starts this new processing program there will be a NEW option to pay via EBAY. The PP option will remain and it will be processed just as it is today, directly to the seller's account. In addition to having PP as a payment option when the new Ebay Payment system comes online, Ebay has said there will be other options as well. As of yet they have not said what those options will be other than PP. These are all SEPARATE ways of being able to pay. The ONLY payment option that Ebay will be processing is the one that will be SPECIFICALLY the Ebay Payment Process option. And that option does NOT use or affect the PP option, they are separate. PayPal spokeswoman Amanda Miller said the company will "continue to provide a comprehensive payments solution to eBay through July 2020." It will also remain a payment option at checkout for eBay customers until July 2023. I just read this: "I believe that Amazon is going against a lot of the states Money Transmitters rules. What I remembered that most states were well under 7 days to get your money and if Amazon is holding onto sellers money longer, they can be find. Sellers should check their states Transmitters law and then file complaints." it may show:Ships from and sold by XXXXX Co. But that means in reality they we sold it to Amazon - and drop shipped it from them as they pay AMAZON - not us ... and Amazon controls all returns and correspondence - which I believe means they are the actual seller of record. How to get around laws in one fell swoop ... they show those sales as "theirs" on their income statement .... and then the profit margin from those sales. You are correct, Marie is wrong! Sellers will not get a buyers payment in Paypal. . . Buyers can pay using Paypal but that payment will go to eBay not the sellers Paypal account. I know this as fact as eBay stated there will be no more Paypal fees for sellers! @val2525 -- nobody knows nothing. This is all in the planning stage. With the other sites, they wait for the package to be delivered and wait about 4 days - one week before letting you redeem your funds. Marie, maybe you should watch and listen closely to the webinar again. "Sellers will no longer pay any Paypal fees"
That is only possible if ebay takes the seller out of the Paypal loop. . .
Why? I never said anything about that. You may want to revisit my postings. But since you brought it up let me try to shed some light on it. The excerpt you posted you took out of context so it is a bit misleading. In full context it takes on something different than you are trying to portray it to mean. They were talking about no longer paying any PP fees when the Ebay payment process is used. That would be absolutely correct. Why would you be forced to pay a PP fee when PP wasn't used??????????????? @Marie, sellers will no longer have a Paypal fee because sellers will no longer be able to accept Paypal. Buyers will still be able to buy with Paypal but sellers will no longer get to accept Paypal! Paypal will no longer be available to sellers by 2021. . . There is some confusion here. Ebay's payment process will NOT be using PP. Ebay will not have any kind of PP account to process payments to sellers. Ebay has a signed contract to use Ayden as their payment processor. For those that use Etsy, we will probably find that Ebay's payment processing will work similar to that. Etsy uses Ayden as well as their payment processing company. With Etsy the buyer can choose to use the Etsy Payment Process OR they can use PP. PP is a completely separate option and has NOTHING to do with the Etsy as the payment processor. On Etsy, those payments made using their payment processing service are released to sellers every couple of week. BUT if the seller wants to get funds sooner the CAN!! They can opt to that. Also in the setting of the payment account, you can have deposits go directly to a bank account OR you can have them go to your PP account. Each seller can chose this for themselves. The sellers can control how often they get the deposits and where the money goes. On Etsy they also allow buyers to pay via PP if they want. That functions just like any other PP payment. It goes directly to the sellers PP account just like is currently being done on Ebay. There is NO difference. You may want to visit the links I provided just a few posts back on this page. I don't know what else to tell you. You are incorrect but clearly I'm not getting my point across. If you watched the webinar in its entirety you would have heard that PP is going to remain a payment option for the foreseeable future. Ebay has a contract with PP through 2023 I believe. I'm not positive on that year. Ebay's contract with PP to be it's primary payment processing option ends in 2021. Which is why Ebay is gearing up to become its own primary payment processor. But as they stated several times in the webinar and elsewhere. PP will remain a separate payment option and they are going to allow other payment options, but they did not expand upon that statement yet. It is Ebay's intention to start with 5% of sellers by the end of the year to use their payment process. That is all the current PP contract will allow. Next year it will be a bit more and then more the following year. In time, Ebay will be the primary payment processor on the site, but according to Ebay, not the only payment option available. So with time, we will know what that really means. As of now we have limited information. @Marie, eBay will indeed have a Paypal account! Listen again at 12:10 ~ Sellers will have 1 PLACE to find all the information they need. ~ 1 PLACE! At 25:30 they say you will go eBay to manage your funds! Buyers will continue to use Paypal, debit or credit cards. Will my Paypal fees go away! ~ YES! Marie, you will get your answer right here! It is very hard to reason with someone that has their mind made up about something. Since you have decided already to close your store on Ebay, I'm not sure why this concerns you so much. From the times in the Webinar you posted above. 5:08 Paypal will CONTINUE to be a payment options as it is today. The "today" part means to me it is going into my PP account directly. 5:20 Paypal will be one of many partners they we will be working with. 9:02 you will find that they state buyers will have ALL the same options of paying as they do TODAY plus the Ebay payment process option. This INCLUDES PP. 8:10 & 12:10 They are talking about "one place to manage" as being Ebay. Ebay is going to have to come up with a report system that allows sellers go get sales reports and other information so that they can have it for taxes. If Ebay is going to become a payment processor, they are going to have to be able to support the data / reports for filing 1099 and for sellers to file federal taxes. 25:30 That area is a puzzle to me. They are really not overly clear as to how this will work yet. It appears that we can go to one place on Ebay to see and access our funds. That does not necessarily mean that it is limited to the Ebay Payment Process program only as they talk about lots of other payment methods they are going to allow. So I can see where this has many of us concerned and confused. As many things are like on Ebay, it is time that is going to reveal the truth. It is possible that the truth lies somewhere between what you see/hear and what I see/hear. We are all trying to make sense of all of this with very limited detailed information. 30:50 Buyers can still pay with PP. Now with that said, there is much about this Webinar that creates more questions than it answers. One of those big questions is about a payment processed using PP. Will it go through the seller's PP account or will it bounce through Ebay's Ayden account? There isn't anything that directly answers that question in the webinar so maybe you are right or maybe I am. Honestly I don't know. What the webinar does say in a couple places is that PP payments will be like they are today and today they go through the seller's accounts. Again, we have to wait for more details from Ebay. 32:00 They start talking about seller protection. They refer to those paying with PP will still have the protections of PP for both buyers and sellers as PP offers. But I must say they quickly run over the subject of seller protection and jump into consumer protection which as we know are not the same thing. I for one any very concerned about Ebay handling chargebacks and the such. 36:20 Now here is something I completely missed when I first listened to this. Probably because it put me to sleep, but I did miss it. Ebay is saying that there will not be separate PP fees to contend with. All fees will come from Ebay. Now that doesn't mean that there is an Ebay PP account our money is running through, but it does mean that Ebay is centralizing the fees. Again, this spirits more questions without answers. That is different than the Etsy payment program. When I have a buyer using PP in Etsy, I have normal looking PP transactions with fees and all. These transactions do not appear on the Etsy Payment screen. We both have good points and I'm confident we both have more questions than answers at this time. In the months to come, Ebay will release more details about the program and maybe answer some of these important concerns. z50com with a basic store, it's smart for me to have one as it saves me money. vw in which I closed that store account this month because of lack of sales. Marie, buyers will continue to use Paypal on eBay like nothing ever happened. Sellers will no longer get Paypal payments from customers directly into their Paypal accounts. For sellers Paypal will disappear completely by 2021. . .Unless eBay decides to allow deposits into your Paypal account from EBAY! Not your EBAY customer but EBAY! ~ That's how there will be NO Paypal fees! ~ You will see in due time, as will I. . .I've been a eBay seller since 1998 and I'm not going anywhere! "I've been a eBay seller since 1998 and I'm not going anywhere!" That's gotta be in the running for double entendre of the year - G rated. I am reading all this drama, back and forth, speculation, sky is falling, doomsday predictions, etc. I sum it up as "whatever". As in whatever happens, we'll just adapt. Ebay will tell us what to do and we'll do it, or leave. Nothing we think, say, or do will change it, so why even put an ounce of effort into it? Ebay will eventually make some decrees, we'll decide how to best handle our positions, and we're either in or out. Worrying will not help. But in fact I did go somewhere, from Orange County to the dumps of the High Desert! We lost our 3/4 million dollar home 6 years ago. . .Paid on the thing for 15 years to only lose it to a bad economy. . .The only upside is the house we are now living in is paid for! marie says " we just don't know yet"
i do know because I never give ebay the benefit of the doubt...they simply do not deserve it. If that is how you feel about Ebay, then the answer for you is simple. Don't sell there and don't buy there. I agree with mcposty. ebay can not be trusted. They lost my respect years ago! I think there are lots of posters on this site that agree with McPosty. What I don't understand is that many of those posters that feel as McPosty does, continue to buy and sell on Ebay. Why? I understand the ones that have left Ebay, but those that choose to say, why?